Greek is spoken by about 12 million people. The majority of these are in Greece and Cyprus‏‎ whilst the Greek diaspora are generally bilingual. This article looks at the kinds of problems Greek as a mother tongue speakers have in learning English. In Greece English films are subtitled on the television rather than dubbed and exposure to English, albeit passively, is widespread. American and British music is popular as well so many students will already have some knowledge of English style, rhythm and idiom. 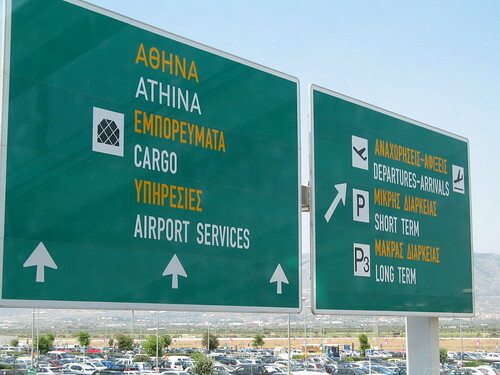 In addition, tourism is a major part of the Greek economy and tourists are everywhere; this means that many Greek families have regular contact with visiting foreigners who almost invariably speak English. Finally many Greeks emigrated during the second half of the 20th century and thus almost every Greek has a family member overseas; there is often contact between them and thus many Greeks have had further exposure to a foreign language. The first obvious difference between English and Greek is the alphabet‏‎ which is significantly different. This means that when writing, beginners‏‎ often have difficulty forming the letters properly and as a teacher you should allow some extra time here for explanation and practice. Greek sentences tend to be much longer and more complex than the SVO‏‎ style of English. When writing English, Greeks will often use what English sees as longer, more convoluted sentence structure. Sometimes it is worth having lessons especially on the style of shorter sentences used in modern English. Commas are common in Greek writing, especially immediately following the subject. This needs to be corrected. This will need to be corrected but does not usually cause too much of a problem. Certain English sounds do not exist in Greek. Time should be spent on these and minimal pair‏‎ practice can help here. In grammar there are a number of common MT influences‏‎. * I went for a walk in the nature. * For some poor people, the life is difficult. Note, grammatically incorrect sentences are shown with an asterisk at the beginning. And there are no indefinite articles‏‎ in Greek so common mistakes include using one instead of a. * Can you pass me one pen? * I saw one car accident last night. * I am good student. * I am working here for five years. * I make phone call now. * I must to go! * I have known her from many years. * I depend from you. * I have closed fifteen years. Meaning, I am fifteen years old. This is a direct translation from Greek. * I have five months to see you. Meaning, I haven’t seen you for five months. This comes from the way the perfect tense is used in Greek. * Can you open/close the light? Meaning, Can you turn on/off the light? This is a direct translation from Greek. In using titles‏‎, Greek often uses Mr/Mrs along with the first name, thus it’s common to hear students (especially younger ones) addressing their teacher as Mister John or Miss Mary. You need to explain that terms like Mr/Mrs are only used with last names in English.